I feel like these are more like a chip than a cracker! Please note that this review was not paid for or sponsored by any third party. I purchased this product with my own money and the opinions in this review are strictly my own. I am not affiliated with Costco or any of its suppliers. I am just a fan of the company. I write these reviews to help my fellow shoppers. Natalie here from Costcuisine again! 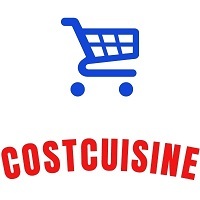 If you want to read more reviews on Costco food products such as this one follow me on Instagram or Facebook and also check out my blog Costcuisine where I review tons of Costco food products each week! 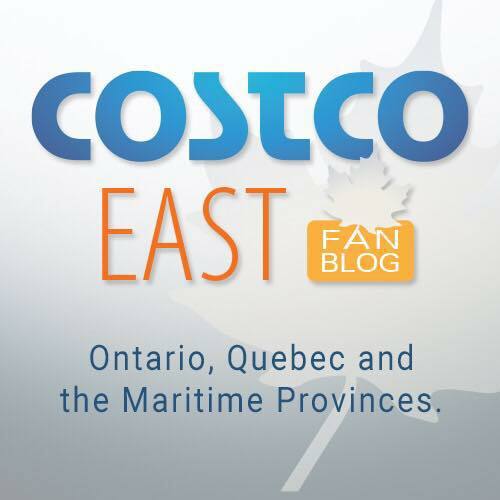 Last week I reviewed Costco Taylor Farms Buffalo Blue Chopped Salad, Costco Kirkland Signature Chocolate Muffins, Costco Frontera Chicken Fajita Bowl, and also reviewed and tweaked a Costco Connection Maple Oatmeal Cookie Recipe! I never really had sweet potato as a kid and have only started eating them in the last few years. Now I’m willing to try all kinds of different variations of sweet potato whether it’s baked, mashed, fries, chips or crackers. I’m always on the hunt for a good cracker because I usually eat crackers at work with my lunch each week, they’re one of those easy items to bring to work that you can pair with a multitude of other things or just eat plain. 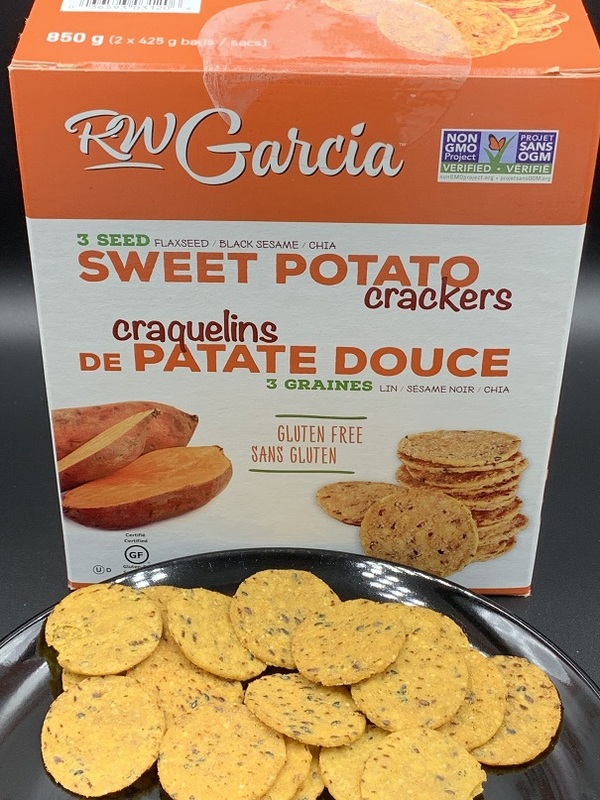 The RW Garcia Sweet Potato Crackers at Costco caught my eye because I’ve never had a sweet potato cracker before and they appear to be somewhat healthy. 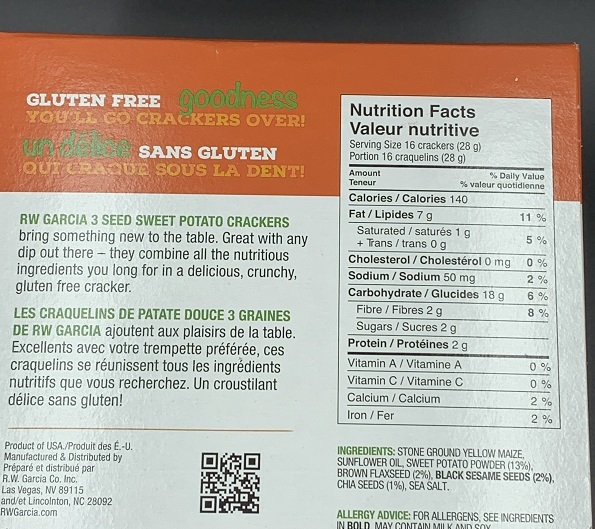 The box states that R.W Garcia is a family owned company and the crackers are NON GMO which are selling points for me. Costco sells a large 850g box with two separate 425g bags for $9.89 Canadian (not on sale). I found the price to be a little on the high side when I opened the bag and could see how big the crackers were tasted what they were like, I would feel more comfortable paying at around the $5 or $6 dollar price point for these crackers. These are tasty, there’s no doubt about that but they aren’t what I was expecting. I pictured a larger, thicker, more substantial cracker. I don’t even know if I would call these crackers, honestly to me they taste like a tortilla chip. That doesn’t mean they aren’t super delicious and slightly unique because they are but I just don’t feel like they’re the true cracker I was expecting. They’re not overly salty and there’s a hint of sweetness from the sweet potato flavor but otherwise picture a sweet potato, multigrain tortilla chip. The multigrain taste comes from the chia, black sesame seeds and flax seeds that add texture and flavor to the “cracker”. I recommend these specifically for dips and spreads. Crackers are one of the most convenient food items there’s no denying that. Initially when I bought the box of Costco R.W Garcia Sweet Potato Crackers I pictured something like larger crackers neatly packaged side by side in a sleeve. However the crackers are just thrown into the two bags, which leads to a lot of broken crackers and small pieces. The box the crackers comes in does help with mitigating the breakage but it still happens. Small broken pieces make it hard to dip and top crackers and also can lead to big messes as you try to pour the crumbs in the bag directly into your mouth. I don’t love the big bags because I find that despite my best attempts to keep things fresh by using clothing pins and ziplock bags, I sometimes can’t finish a big bag of crackers before they get a little stale. I appreciate the short list of ingredients. The main ingredient is corn, embarrassingly I had to google stone ground yellow maize to find out that this is basically ground corn. Initially thought the nutrition information was pretty fantastic, 16 crackers for 140 calories, seven grams of fat and two grams of fibre, protein and sugar. It’s definitely not at all close to being super unhealthy or anything but it’s so easy to eat 16 or more of these. They’re small and seven grams of fat seems high to me compared to other crackers. The second ingredient is sunflower oil so that must be where the fat is coming from. I’ve been bringing these to work to finish up the bag and although I really enjoy the taste I feel like I’m eating tortilla chips almost daily now when I used to have them as more of a treat. I found these slightly overpriced as they taste quite similar to tortilla chips that are much cheaper but lacking in the sweet potato department. The RW Garcia Sweet Potato Crackers pair well with the Costco Something Special Red Pepper Chili Spread and a little bit of brie. You must try it! So would you say these look more like a cracker or a chip? What kind of dip would you serve these with? Black Friday Deals – Costco Warehouse and Online!! As promised, here are all the Black Friday Deals Costco has to offer! Not a fan,taste very oily to me.